In macrophages, two signaling pathways, dependent on MyD88 or TIR domain-containing adaptor-inducing IFN-β (TRIF) signaling, emanate from the LPS receptor TLR4/MD-2. In this study, we show that in murine bone marrow-derived mast cells (BMMCs), only the MyD88-dependent pathway is activated by LPS. 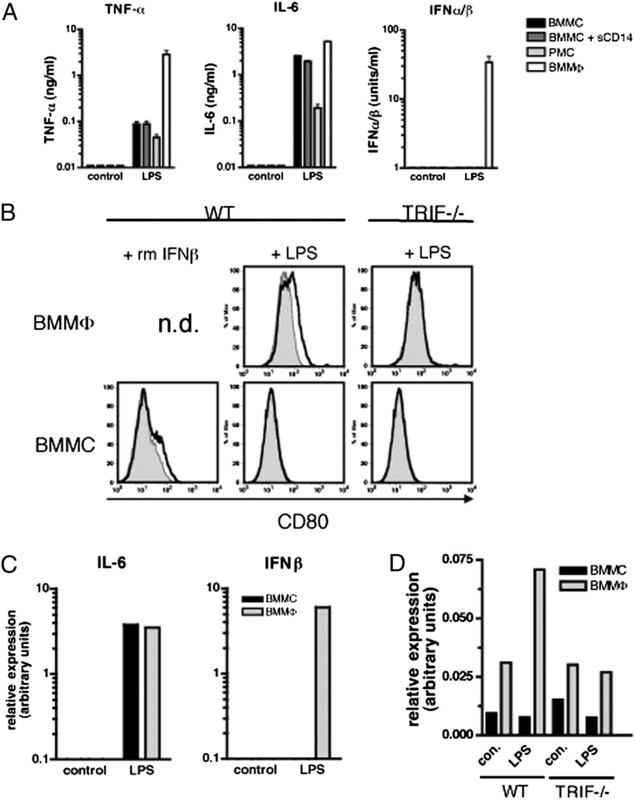 The TRIF signaling branch leading both to NF-κB activation and enhanced proinflammatory cytokine production, as well as to IRF3 activation and subsequent IFN-β production, is absent in LPS-stimulated BMMCs. IRF3 activation is also absent in peritoneal mast cells from LPS-injected mice. We observed strongly diminished TRAM expression in BMMCs, but overexpression of TRAM only moderately enhanced IL-6 and did not boost IFN-β responses to LPS in these cells. A combination of very low levels of TRAM and TLR4/MD-2 with the known absence of membrane-bound CD14 are expected to contribute to the defective TRIF signaling in mast cells. We also show that, unlike in macrophages, in BMMCs the TRIF-dependent and -independent IFN-αβ responses to other recognized IFN inducers (dsRNA, adenovirus, and B-DNA) are absent. These results show how the response to the same microbial ligand using the same receptor can be regulated in different cell types of the innate immune system. Lipopolysaccharide is the primary component used by the mammalian innate immune system for sensing Gram-negative bacteria. The interaction of LPS with target cells leads to the formation and release of endogenous mediators and to the upregulation of costimulatory molecules. These events initiate inflammatory and modulate adaptive immune responses, which are essential for the antibacterial defense. They are also responsible for the clinical symptoms of infection and, in the worst case, can lead to endotoxin shock and death of the infected host. The activation of cells by LPS is mediated by the TLR4/myeloid differentiation-2 (TLR4/MD-2) complex, where MD-2 contains the LPS recognition site and TLR4 acts as the essential signaling component (1, 2). Activation of TLR4/MD-2 is preceded by the transfer of LPS to membrane-bound or soluble (s) CD14 by the plasma protein LBP (LPS binding protein) (3, 4). Recently, the requirement of CD14 and LBP for the activation of TLR4/MD-2 was shown to depend on the LPS chemotype (5, 6). Activation of cells by LPS molecules containing O-polysaccharide chains (S-LPS), require CD14 and LBP while LPS lacking the O-polysaccharide part (R-LPS) activate TLR4/MD-2, also in the absence of CD14 and LBP. The triggering of the LPS receptor stimulates the recruitment of four intracellular Toll–IL-1R (TIR)-domain-containing adaptors MyD88, TIR domain-containing adaptor protein (TIRAP) (7, 8), TIR domain-containing adaptor-inducing IFN-β (TRIF), and TRIF-related adaptor molecule (TRAM) (9, 10) and a subsequent activation of two signaling pathways (11). The MyD88-dependent signaling cascade depends on the presence of TIRAP and leads ultimately to the activation and nuclear translocation of the transcriptional regulators AP-1, IRF5, and early NF-κB (12, 13). This results in the production of proinflammatory cytokines, including TNF-α and IL-6 (11). Signaling through TRIF depends on the presence of TRAM and culminates in the activation of the transcription factor IRF3 and subsequent production of IFN-β (14–16). Moreover, it leads to a delayed NF-κB activation and contributes to the production of proinflammatory cytokines elicited via the MyD88-dependent pathway (17). In the absence of MyD88 signaling, LPS inflammatory activity is lost, but the LPS-induced IFN-β response is unimpaired (18). The absence of TRIF signaling results in a strong reduction of the inflammatory and a complete loss of the IFN-β response to LPS (15, 16). While it is generally thought that activation of the MyD88 signaling pathway through TLR4 is initiated from the plasma membrane (19), the site of initiation of the TRIF pathway activation is less clear. A recent study showed that the delivery of TLR4 and TRAM to the endosome and subsequent recruitment of TRIF precedes the initiation of the TRIF pathway (20). Another study proposed that TRIF-dependent signaling from TLR4 might be dissected into two steps (21). TRAF6 mediates early TRIF signaling from the plasma membrane in the first step, whereas TRAF3 mediates TRIF signaling from the endosome-lysosome in the second step. Thus, only the TRAF3-dependent signaling branch requires the translocation of TLR4 and TRAM into the endosome-lysosome. This translocation was shown to be strictly CD14 dependent (21). The ability to induce two signaling pathways is unique for TLR4 activation and explains, at least in part, the high potency of LPS in activating the innate immune system. Different cell types, including macrophages and mast cells, participate in the immune recognition of LPS. Although the importance of macrophages in mediating LPS effects is well established and the signaling pathways involved in eliciting these effects are currently under intense investigations, the role of mast cells and their signaling pathways in the response to LPS has attracted much less attention until now. Mast cells located at the interface between host and environment (i.e., in the skin and at mucosal surfaces) are exposed to LPS from Gram-negative bacterial commensals and invading pathogens. Therefore, the effects of LPS on mast cells and their signaling pathways are of great interest. Unlike macrophages, mast cells do not express membrane-bound (m) CD14 (5). This absence of mCD14 means they can be efficiently activated only by R-form, but not by S-form LPS (5). In this murine study, we investigated the contribution of the MyD88- and TRIF-dependent signaling pathways to the LPS-induced cytokine responses in bone marrow-derived mast cells. We show that the activation of mast cells by LPS is completely independent of the TRIF pathway. Accordingly, the activation of IRF3 and the MyD88-independent delayed induction of NF-κB are absent in LPS stimulated mast cells. It is therefore not surprising that mast cells, in contrast to macrophages, do not produce IFN-β in response to LPS and moreover that IL-6 or TNF-α responses in LPS-treated mast cells from wild type (WT) and TRIF-deficient mice are comparable. In addition, we show that mast cells do not express IFN-αβ in response to IFN inducers, such as dsRNA (22–24), B-DNA (25), and adenovirus (26), which use distinct, TLR4-independent endosomal or cytosolic receptors. R-LPS from Salmonella minnesota R595 mutant (TLRgrade, ready to use) and synthetic dsRNA (polyinosinic-polycytidylic acid [poly-IC]; TLRgrade) were from Alexis Biochemicals (Enzo Life Sciences, Lörrach, Germany). Recombinant murine CD14 was purchased from Biometec (Greifswald, Germany). Endotoxin content of CD14 was determined to be less than 1 pg LPS/1 μg protein, using Limulus amebocyte lysate test (Pyroquant Diagnostic, Mörfelden, Germany) (27). The following Abs were used: anti–p-p38 (T180/Y182) and p-IRF3 (S396) from Cell Signaling Technology (Frankfurt, Germany); anti–NF-κB p65 ([C-20]:sc-372) and anti-actin ([I-19][sc-1616]) from Santa Cruz Biotechnology (Heidelberg, Germany); anti-IRF3 from Zymed (San Francisco, CA); anti-TRAM and anti–p-TRAM from Fabgennix (Frisco, TX); anti–rabbit-horseradish peroxidase (HRPO) (goat) and anti-goat IgG-HRPO (rabbit) from Pierce (Rockford, IL); biotinylated anti-mouse CD80 (RM6915) from Caltag Laboratories (Hamburg, Germany); ATTO 647N-conjugated anti-mouse TLR4/MD2 (MTS510) from Alexis Biochemicals (Enzo Life Sciences, Lörrach, Germany); allophycocyanin-conjugated anti-F4/80 and anti–c-Kit, FITC-conjugated anti-ST2, rabbit Igs, and streptavidin-PE and streptavidin-Cyanine 5 from BD Bioscience (Heidelberg, Germany); anti-hemagglutinin (HA, clone 3F10) from BIOMOL; and anti-mouse IgE from Southern Biotechnology (Birmingham, AL). WT C57BL/6 as well as mice deficient for TRIF (16), IRF3 (28), CD14 (29), and MyD88 (30), all on C57BL/6 background, were bred under specific pathogen-free conditions in the animal facilities of the Max Planck Institute of Immunobiology and Epigenetics. Breeding pairs of TRIF-deficient mice were provided by B. Beutler (Department of Immunology, The Scripps Research Institute, La Jolla, CA); pairs of IRF-3−/− mice were provided by T. Taniguchi and K. Honda (Department of Immunology, Graduate School of Medicine, University of Tokyo, Japan); pairs of MyD88−/− mice were provided by M. Kopf (ETH Zürich, Zürich, Switzerland) and R. Landmann (Department Forschung, Kantonspital Basel, Switzerland); and pairs of CD14−/− mice were provided by M.W. Freeman (Massachusetts General Hospital, Boston, MA). Mice of both sexes, 6–10 wk old, were used for the experiments. To assess mast cell and macrophage activation by LPS in vivo, WT C57BL/6 mice were injected with 10 μg LPS/0.2 ml 0.15 M glucose or 0.2 ml 0.15 M glucose only (control), i.p., and peritoneal cells for FACS analysis were collected 1 h (p-p38) or 2 h (p-IRF3) later. All the experimental procedures were performed in accordance with institutional, state, and federal guidelines on animal welfare. Ad5-GFP, an early gene expression defective human adenovirus of species C, was grown, purified, and stored as described previously (31). The ratio of infectious to total viral particles was determined on susceptible cells and was typically 1:20–50. Virus preparation was LPS-free (<1 pg LPS/1011 viral particles) as determined by the Limulus amebocyte lysate test (27). Bone marrow-derived macrophages (BMMΦ) were generated from bone marrow precursor cells in the presence of l–cell-conditioned medium in hydrophobic Teflon bags as described previously (32). After 10 d of culture, the cells were washed and resuspended in a serum-free, high-glucose formulation of DMEM for further use. Bone marrow-derived mast cells (BMMCs) derived from bone marrow precursor cells were grown in the presence of 1% X63Ag8–653-conditioned medium as a source of IL-3 as described (33, 34). As previously published (35) differentiated BMMCs were positive for FcεR1, c-Kit, ST2, CD13, and CD45. The purity of cultures was verified as described (33). A more detailed characterization of BMMCs performed earlier in our laboratory revealed a granular appearance after Toluidine blue staining and upon electron microscopic examination (33, 34). BMMCs preloaded with anti-DNP IgE secreted prestored mediators and produced cytokines after engagement with Ag (34). Peritoneal mast cells (PMCs) were propagated from peritoneal lavage in the presence of 1% X63Ag8–653-conditioned medium and 1% of steel factor-containing conditioned medium (provided by J. Kirberg, Paul-Ehrlich Institute, Langen, Germany) as described (36). The resulting PMCs were larger than BMMCs (judged by side scatter) and positive for FcεR1, c-Kit, and ST2. After stimulation with Ag, PMCs degranulated and produced proinflammatory cytokines. As described previously (36), they expressed higher proteolytic activity compared with BMMCs (data not shown). BMMCs or PMCs were suspended in RPMI 1640 supplemented with 0.1% of human serum albumin (Bayer, Leverkusen, Germany) for further use. For cytokine induction, BMMΦ (105 cells/0.2 ml) were placed in 96-well plates (Nunc, Roskilde, Denmark) and cultured for 24 h at 37°C in a humidified atmosphere containing 8% CO2. After exchanging the medium, cells were stimulated in triplicates with agents under test and culture supernatants for determination of TNF-α were collected after 4 h, of IFN-αβ after 6 h, and of IL-6 after 24 h of culture. Mast cells (2 × 105 cells/0.2 ml) were stimulated in 96-well plates in triplicates at 37°C in a humidified atmosphere containing 5% CO2. Culture supernatants for determination of cytokines were collected after 3 h (TNF-α) and 24 h (IL-6, IFN-αβ) of culture. BMMΦ and BMMCs (6 × 106 cells) were transfected with pmaxGFP using the nucleoporator apparatus and the mouse macrophage nucleofector kit from Amaxa (Lonza, Walkersville, MD) according to the instructions of the supplier. Gene expression was analyzed in FACS-sorted GFP-positive cells. An expression vector for HA-tagged full-length TRAM (pCMV-TRAM, sequence available upon request) was constructed by amplifying the complete murine TRAM coding sequence in exon3 by PCR from mouse genomic DNA and cloning into pHAUS. This resulted in the fusion of the peptide MGYPYDVPDYAPG containing the HA tag (underlined) to the C terminus of TRAM. The TRAM-HA insert was then cloned into an expression vector downstream of a CMV promoter. The TRAM-HA–containing transcript also contains a downstream IRES-tdTomato cassette. A control vector (pCSG00iT) was also constructed and consisted of the same plasmid backbone, but contained GFP instead of TRAM-HA. BMMCs (8 × 107 cells) were transfected by electroporation (Neon Transfection System, Invitrogen, 1600V; 30 ms pulse width, 1 pulse, 100 μl capillary; 1.1 × 106 cells per electroporation) using a ratio of 3 × 106 cells per microgram pCMV-TRAM or pCSG00iT. The transfection efficiency was 20–40%. TRAM- or GFP-positive cells were sorted 10 h after transfection using MoFlo (Dako Cytomatic, Glostrup, Denmark) to a typical purity of 96–98%. IL-6 levels in culture supernatant were estimated by ELISA using the MP5-20F3 rat anti-mouse IL-6 Ab (Pharmingen, San Diego, CA) as capturing Ab and the MP5-32C11 biotinylated rat anti-mouse IL-6 Ab (Pharmingen) as detection reagent for IL-6, according to the instructions of the supplier. The detection limit of the assay was 10 pg/ml. TNF-α levels in culture supernatants were determined in a cytotoxicity test using a TNF-α–sensitive L929 cell line in the presence of actinomycin D as described previously (37, 38). The detection limit of the assay was 5 pg/ml. IFN-αβ levels were measured using an L929 cell line transfected with an IFN-sensitive (ISRE) luciferase construct as described (39). The detection limit of the assay was 1 U/ml. The stimulation of BMMΦ and BMMCs was stopped by adding excess ice cold PBS with 1 mM NaVO4. Cells were centrifuged and lysed in radioimmunoprecipitation assay buffer (40) supplemented with phosphatase inhibitor mixture I + II (Sigma, Munich, Germany), protease inhibitor mixture (Sigma) and PMSF (Sigma). To prepare nuclear extracts, cells were lysed (5 min, 4°C) in L1 buffer (41) supplemented with phosphatase inhibitor mixture I + II, protease inhibitor mixture, and PMSF. Nuclear proteins were extracted using L1 buffer plus 250 mM NaCl for 10 min. Cell lysates (50 μg protein per lane) were fractionated by SDS-polyacrylamide gel electrophoresis under reducing conditions and transferred to nitrocellulose membrane (Amersham Life Science, Buckinghamshire, U.K.). Nonspecific binding was blocked by incubation of membranes in TBS containing 5% powdered milk. Membranes were incubated overnight at 4°C with first Ab diluted in TBS containing 0.5% BSA and after washing with TBS/0.1% Tween the secondary HRPO-labeled Ab was added for 1 h at room temperature. After washing, specific proteins were detected with ECL reagents (ECL; Amersham Pharmacia Biotech, Zürich, Switzerland) and exposed to high-performance chemiluminescence film (Amersham). Total RNA was isolated from cells by a guanidinium isothiocyanate-phenol-chloroform-isoamyl alcohol procedure as described previously (42). Total RNA (1 μg) was reverse transcribed with Moloney Murine Leucaemia Virus reverse transcriptase (M-MuLV-RT) and oligo-p(dT) primers (Expand Reverse Transcriptase Kit; Roche, Basel, Switzerland) according to the manufacturer’s instructions. Conventional RT-PCR was performed using HotStart Taq DNA polymerase (Genaxxon) according to the manufacturer’s instructions. The primer pairs for amplification of murine TRAM, TRIF, and β-actin were: TRAM: sense, 5′-ACT CTG TCA TGG GTG TTG GG-3′; antisense, 5′-CAC TGC TCT GCT CCA CAA AA-3′; TRIF: sense, 5′-GTC TGT CAG GAG GTG CTC-3′; antisense, 5′-CGT TCC GGA CAT GCT CTT TCT C-3′; β-actin: sense, 5′-TGG AAT CCT GTG GCA TCC ATG AAA-3′; antisense, 5′-TAA AAC GCA GCT CAG TAA CAG TCC-3′. Real-time PCR quantification of RNA expression was done using the LightCycler II system (Roche) and the Quantitect SYBR Green PCR Kit (Qiagen) according to the instructions of the manufacturers. Arbitrary units of relative expression were generated by dividing the value obtained for mRNAs under test by the value of β-actin and multiplying the result by 1000. The following primers were used for real-time RT-PCR: β-actin: sense, 5′-TGG AAT CCT GTG GCA TCC ATG AAA-3′; antisense, 5′-TAA AAC GCA GCT CAG TAA CAG TCC G-3′; IFN-β: sense, 5′-CCT TTG CAC CCT CCA GTA ATA G-3′; antisense, 5′-GAC GGA GAA GAT GCA GAA GAG T-3′; IL-6: sense, 5′-GTG ACA ACC ACG GCC TTC CCT AC-3′; antisense, 5′-TGC AAG TGC ATCATCGTTGTTCAT-3′. All PCR products were resolved by 2% agarose gel electrophoresis and were visualized by ethidium bromide staining. Chromatin immunoprecipitation assay was performed as described (31). Cells were cross-linked with 1% formaldehyde, and sonicated nuclear extracts were mock-immunoprecipitated or immunoprecipitated with anti-tetraacylated histone 4 (Upstate, Billerica, MA). Recovered DNA aliquots from these samples and from input extracts were amplified with real-time PCR using the LightCycler II system (Roche) and Quantitect SYBR Green PCR Kit (Qiagen, Hilden, Germany). Enrichments at specific chromatin loci are shown as the amount of immunoprecipitated DNA in the percent of total input chromatin. The following primers were used: IFN-β promoter: sense: 5′-GGG CAG CCC CAG AGG GAA TGA ACT C-3′ and antisense: 5′-TAT GGC AGA GGC TCC GTG GAA AAC TCA CT-3′, IL-6 promoter: sense: 5′-TGG GGA TGT CTG TAG CTC ATT-3′ and antisense: 5′-CAT AGC GGT TTC TGG AAT TGA-3′. Primers for topoisomerase promoter are described by Fejer et al. (26). TLR4/MD2 complex on cells was detected with ATTO 647N-conjugated anti-TLR4/MD2 and CD80 with streptavidin-cyanine 5 recognizing a biotin-conjugated anti-CD80. Nonspecific binding was blocked by incubation with 10% normal mouse serum. Phosphoprotein staining was performed as described previously (43). A minimum of 10,000 cells was acquired for each sample. Cells were analyzed on a FACSCalibur machine (Becton Dickinson, San Jose, CA) and data statistically elaborated using FlowJo software (Tree Star, Ashland, OR). Data were analyzed using Prism GraphPad 4.0 software (GraphPad Software, La Jolla, CA). Data in all figures are presented as mean, and error bars show SD. Statistical analysis was performed with unpaired t test (*p ≤ 0.05, **p ≤ 0.01, ***p ≤ 0.005). To investigate the contribution of MyD88 and TRIF signaling to the induction of cytokines by LPS in mast cells, we first compared the ability of LPS-stimulated mast cells and macrophages to produce TNF-α, IL-6 (both MyD88- and TRIF-dependent), and IFN-β (exclusively TRIF-dependent). For this purpose murine BMMCs, PMCs, and BMMΦ were stimulated with R-form LPS of S. minnesota R595 (R-LPS). This LPS preparation was used throughout the study. Because mast cells are less susceptible to LPS than BMMΦ (5) (Supplemental Fig. 1), we used a 10-fold higher concentration of LPS (10 μg/ml) for their stimulation than for stimulation of macrophages (1 μg/ml). As shown in Fig. 1A, LPS-stimulated BMMCs and PMCs produced TNF-α and IL-6, albeit at lower levels than seen in BMMΦ; however, in contrast to LPS-stimulated BMMΦ, they produced no detectable IFN-β. Because LPS triggering of cells through the TRIF pathway was shown to be CD14 dependent and mast cells are CD14-negative, we also stimulated BMMCs in the presence of sCD14 (2 μg/ml). However, no IFN-β response was detectable in BMMCs under these conditions (Fig. 1A). Mast cells fail to produce type I IFN in response to LPS. A, Production of TNF-α, IL-6, and type I IFN. WT BMMΦ (5 × 105 cells/ml) and mast cells (BMMCs and PMCs; 106 cells/ml) were stimulated with 1 μg and 10 μg R-LPS/ml, respectively. In addition, mast cells were stimulated with LPS in the presence of sCD14 (2 μg/ml). TNF-α, IL-6, and type I IFN were determined in culture supernatants as described in Materials and Methods. Although the bioassay used for type I IFN determination does not discriminate between IFN-α and IFN-β, it is well documented that LPS activation of murine cells in vitro or of mice in vivo elicits exclusively an IFN-β response (65, 66). Control, mock-stimulated cells. Each point is the mean of triplicates ± SD. Comparable results were obtained with four to five independent BMMC and BMMΦ cultures. B, FACS analysis of LPS- or rmIFN-β–induced upregulation of CD80. WT and TRIF-deficient BMMΦ and BMMCs (106 cells/ml) were stimulated with 1 μg and 10 μg R-LPS/ml, respectively. In addition, BMMCs were stimulated with recombinant murine (rm) IFNβ (1000 U/ml). CD80 expression was determined after 24 h of stimulation by FACS-analysis. Gray curve, mock-stimulated cells; black curve, stimulated cells. Comparable results were obtained with three independent BMMC and BMMΦ cultures. C, Induction of IFN-β and IL-6 mRNA. WT BMMΦ and BMMCs (106 cells/ml) were stimulated for 2 h with 1 μg and 10 μg/ml of R-LPS, respectively. Total RNA was extracted (from 3 × 106 cells per sample), and expression of IL-6 and IFN-β was analyzed by quantitative RT-PCR. Values were normalized to β-actin expression. Comparable results were obtained with two independent BMMC and BMMΦ cultures. D, Analysis of histone H4 acetylation at the IFN-β promoter. WT and TRIF-deficient BMMΦ and BMMCs (2 × 107 cells/ml) were stimulated for 2 h with 1 μg/ml and 10 μg/ml R-LPS, respectively. Acetylation of histone H4 was determined at the IFN-β promoters by chromatin immunoprecipitation analysis and normalized against values obtained from the topoisomerase promoter. Comparable results were obtained with two independent BMMC and BMMΦ cultures. Con., mock-stimulated cells; n.d., not determined. Activation of IFN-αβ genes initiates autocrine-paracrine induction of secondary gene expression, including the costimulatory molecule CD80 (44). 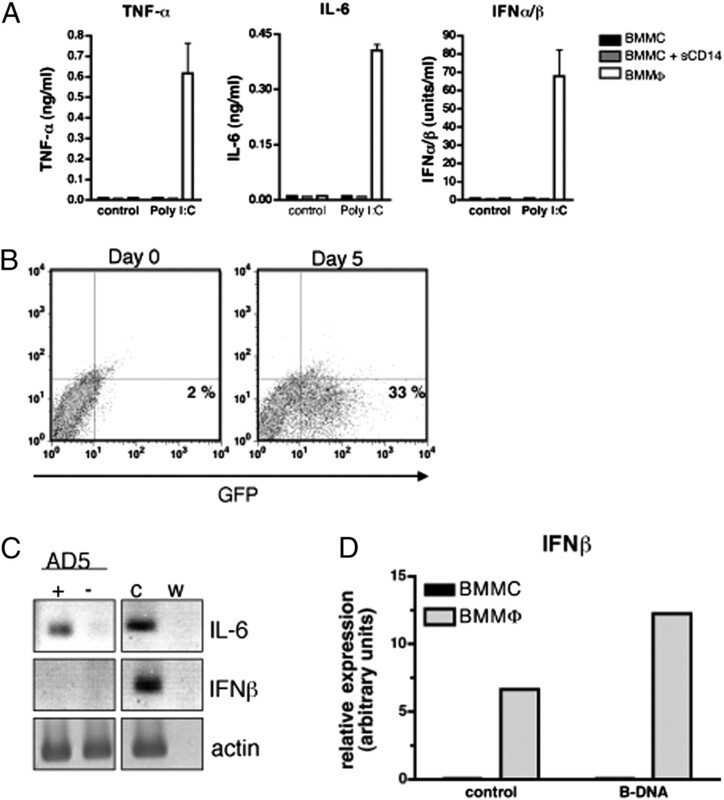 In agreement with this finding, BMMCs treated with murine recombinant IFN-β or WT BMMΦ treated with LPS, which induces IFN-β, exhibited enhanced expression of CD80 on their surface (Fig. 1B). The lack of CD80 upregulation in LPS-stimulated TRIF-deficient BMMΦ confirmed the crucial role of IFN-β. Furthermore, LPS-stimulated BMMCs from both WT and TRIF-deficient mice failed to upregulate CD80 (Fig. 1B). These data further support our finding that mast cells do not produce IFN-β in response to LPS. To analyze the reason for the absence of IFN-β production in mast cells, we stimulated BMMCs and BMMΦ for 2 h with LPS and determined the expression of IFN-β and IL-6 mRNAs by quantitative RT-PCR. As shown in Fig. 1C, LPS induced comparable IL-6 mRNA expression in both cells types, whereas it induced expression of IFN-β mRNA only in BMMΦ but not in BMMCs. In additional experiment, the levels of acetylation of histone H4 at the IFN-β promoter in unstimulated and LPS-stimulated BMMCs and BMMΦ was compared. This histone alteration is considered to be a positive mark that associates with open, transcriptionally active chromatin. Using a chromatin immunoprecipitation assay, a certain degree of acetylation of H4 at the IFN-β promoter was already detectable in both unstimulated WT and TRIF-deficient BMMΦ. Two hours after LPS treatment, the degree of acetylation increased only in LPS-stimulated WT, but not in TRIF-deficient BMMΦ (Fig. 1D). This finding is in accordance with the known requirement for TRIF in the induction of IFN-β by LPS. Compared with BMMΦ, unstimulated BMMCs (WT and TRIF-deficient) showed only an extremely low level of H4 acetylation at the IFN-β promoter that was not enhanced upon stimulation with LPS (Fig. 1D). In contrast, a relatively high level of H4 acetylation was found at the IL-6 promoter in unstimulated mast cells. This high acetylation level was not enhanced further by LPS treatment in BMMCs, whereas a comparably high level was reached in BMMΦ only after stimulation with LPS (Supplemental Fig. 2A). Our results indicate that the IFN-β gene, which is accessible for transcription in LPS-stimulated TRIF-competent macrophages, remains closed in LPS-stimulated mast cells. Our results document the absence of IFN-β induction in LPS-stimulated mouse mast cells. The induction of IFN-β by LPS is strictly dependent on the TRIF-mediated activation of IRF3. We analyzed the phosphorylation of IRF3 in LPS-activated BMMCs and BMMΦ, in addition to the MyD88- and TRIF-dependent phosphorylation of the kinase p38 as a control (45). The induction of p-p38 and p-IRF3 was detected in lysates of cells stimulated with LPS for different lengths of time (15–90 min) by Western blotting. As shown in Fig. 2A, LPS treatment induced higher levels of p-p38, which was detectable after 15 min, was maximal after 30 min, and decreased again after 90 min of stimulation in both cell types. p-IRF3 was not seen in unstimulated cells and was induced only in BMMΦ, but not in BMMCs. This situation was not influenced by the presence or absence of sCD14 in the stimulation medium (Fig. 2A). 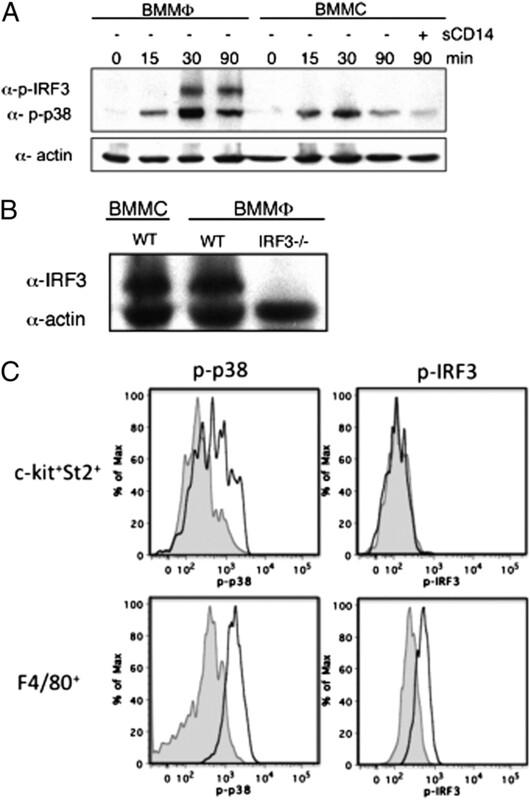 LPS-induced IRF3 activation is impaired in mast cells. A, Time course of IRF3 phosphorylation. WT BMMΦ and BMMCs (107 cells/ml) were stimulated with 1 μg and 10 μg R-LPS/ml, respectively, as indicated. In addition, BMMCs were stimulated with LPS in the presence of sCD14 (2 μg/ml). Cell lysates were analyzed by Western blot with Abs to p-IRF3, p-p38, and actin (loading control). Comparable results were obtained with four independent BMMC and BMMΦ cultures. B, Expression of IRF3. Cell lysates of unstimulated WT and IRF3-deficient BMMΦ and WT BMMCs were analyzed by Western blot with anti-IRF3. Detection of actin served as loading control. Comparable results were obtained with two independent BMMC and BMMΦ cultures. C, Activation of p38 and IRF3 in peritoneal mast cells and macrophages by LPS in vivo. WT mice were injected with 10 μg R-LPS or diluent (controls) i.p., and peritoneal cells for FACS analysis were obtained 1 h (p-p38) or 2 h (p-IRF3) later. Intracellular expression of p-p38 and p-IRF3 in c-Kit+ST2+ mast cells and F4/80+ macrophages was analyzed as described in Materials and Methods. One representative experiment of three is shown. Gray curve, cells from controls; black curve, cells from LPS-treated animals. To investigate whether the IRF3 protein might be absent from mast cells, we analyzed the lysates of BMMCs and BMMΦ by Western blotting using IRF3-specific Abs. As shown in Fig. 2B and Supplemental Fig. 2B, the Abs revealed a single band of the expected size in WT BMMCs and BMMΦ, but not in IRF3−/− cells (Fig. 2B). This finding indicates that IRF3 is present in both types of cells. To test the in vivo relevance of our data, we investigated the activation of IRF3 and p38 in peritoneal mast cells (c-Kit+ST2+) and macrophages (F4/80+) from LPS-injected mice using p-IRF3 and p-p38 Abs and FACS. As shown in Fig. 2C, the phosphorylation of p38 was induced in both cell types, and the phosphorylation of IRF3 was induced only in macrophages, but not mast cells. The data verify the absence of IRF3 activation in LPS-activated mast cells in vivo. It is well documented that the loss of TRIF function in macrophages impairs not only IFN-β, but also proinflammatory cytokine responses to LPS. In agreement with this finding, the TNF-α and IL-6 responses of TRIF-deficient BMMΦ induced by the R-LPS were substantially lower than those of WT cells (Fig. 3A, lower panel). The TRIF deficiency, however, did not affect the same responses in BMMCs (Fig. 3A, upper panel) in the presence or absence of sCD14, which suggested that TRIF signaling does not contribute to proinflammatory cytokine responses in these cells. TRIF-dependent nuclear translocation of NF-κB p65 is absent in LPS-stimulated BMMCs. A, Induction of TNF-α and IL-6 in WT and TRIF-deficient BMMCs and BMMΦ. WT and TRIF-deficient BMMCs (106 cells/ml) and BMMΦ (5 × 105 cells/ml) were stimulated with 10 μg and 1 μg R-LPS /ml, respectively. In addition, BMMCs were stimulated with LPS in the presence of sCD14 (2 μg/ml). Cytokines were determined in culture supernatants as described in Materials and Methods. Each point is the mean of duplicates ± SD. Comparable results were obtained with three independent BMMC and BMMΦ cultures. Control, mock-stimulated cells. 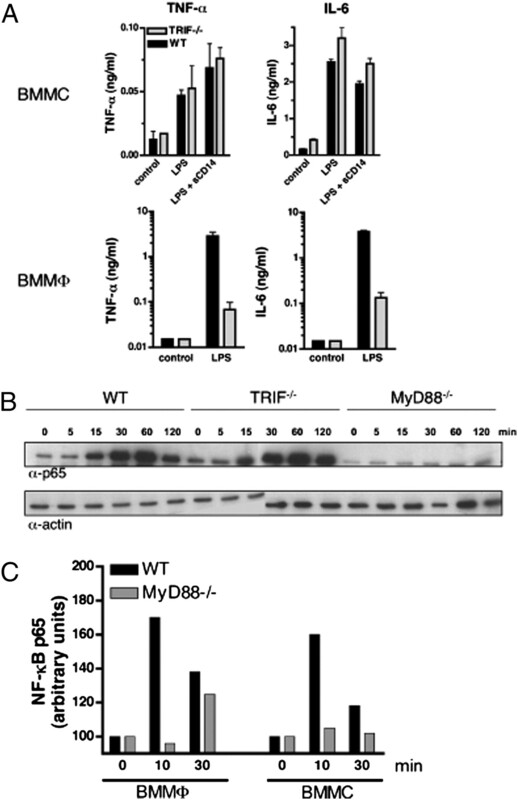 B, Nuclear translocation of NF-κB p65 in WT, TRIF-deficient, and MyD88-deficient BMMCs. WT, TRIF-deficient, and MyD88-deficient BMMCs (107 cells/ml) were stimulated with 10 μg/ml R-LPS as indicated. Nuclear extracts of unstimulated and stimulated cells were analyzed by Western blot using Abs to NF-κB p65 and actin (loading control). Comparable results were obtained with four independent BMMC cultures. C, Nuclear translocation of NF-κB p65 in WT and MyD88-deficient BMMCs and BMMΦ. WT and MyD88-deficient BMMΦ and BMMCs (107 cells/ml) were stimulated with 1 μg/ml and 10 μg/ml R-LPS, respectively, as indicated. Nuclear extracts were analyzed by Western blot using Abs to NF-κB p65 and actin. The densities of the bands were analyzed using ImageJ software, and NF-κB p65 values were normalized to actin. Comparable results were obtained with four independent BMMC and BMMΦ cultures. An optimal TNF-α and IL-6 response to LPS was shown to depend on the activation of NF-κB by both MyD88- and TRIF-dependent signaling pathways (46). In additional experiment, we analyzed NF-κB activation in BMMCs from WT, MyD88-deficient, or TRIF-deficient mice stimulated with LPS. Mast cells from all three mice strains were stimulated with LPS for 5–120 min and the translocation of NF-κB p65 into the nucleus was followed by Western blot analysis. As shown in Fig. 3B, enhanced expression of NF-κB p65 was detectable in the nuclei of both WT and TRIF- deficient cells between 15 to 120 min. In contrast, no enhanced NF-κB p65 translocation was observed in LPS stimulated MyD88-deficient mast cells. In a control experiment, MyD88-deficient BMMΦ, in contrast to mast cells, exhibited enhanced nuclear expression of NF-κB p65 30 min after LPS treatment (Fig. 3C). These results document the absence of LPS-induced, MyD88-independent NF-κB translocation in BMMCs. Because TRIF signaling from TLR4 was shown to require CD14, and because BMMCs do not express CD14, we wanted to have a closer look in BMMΦ at the contribution of CD14 to the induction of IL-6 and IFN-β by the R-form LPS, used throughout this study. BMMΦ from CD14-deficient, TRIF-deficient, and WT mice were stimulated with LPS (20 ng/ml), and the IL-6 and IFN-β responses were measured. In agreement with our previous results (5), the absence of CD14 did not negatively influence the LPS-induced IL-6 production (Fig. 4). 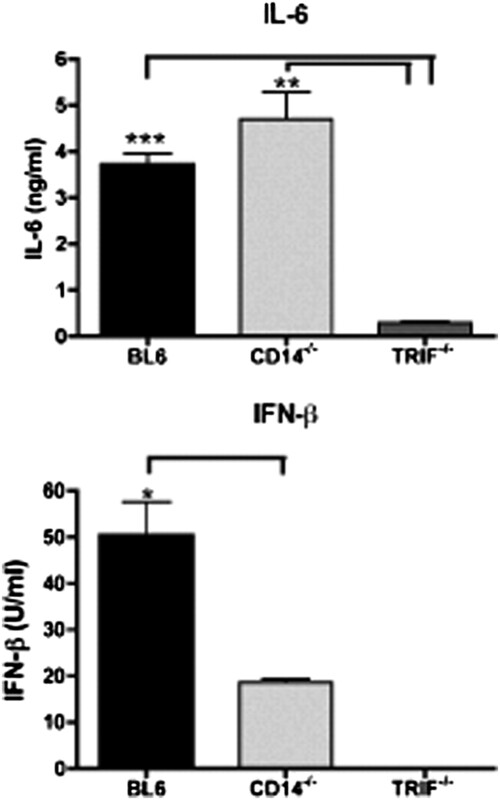 Furthermore, it reduced but did not prevent the IFN-β response to LPS. In contrast, the absence of TRIF strongly reduced the IL-6 response and completely abrogated IFN-β responses to this low dose of LPS. Clearly, the absence of TRIF signaling exhibits a much more pronounced effect on the production of cytokines in macrophages than does the absence of CD14. On the whole, the data reveal that MyD88- and TRIF-dependent responses to R-form LPS can be CD14 independent at least in part. It seems therefore unlikely that the absence of CD14 in BMMCs is the reason for the complete absence of TRIF signaling in these cells. Loss of CD14 reduces but does not abrogate the IFN-β response to R-form LPS in macrophages. WT, CD14-deficient, and TRIF-deficient BMMΦ (5 × 105 cells/ml) were stimulated with 0.02 μg/ml R-LPS. IL-6 and IFN-β were determined in culture supernatants as described in Materials and Methods. Each point is the mean of triplicates ± SD. Comparable results were obtained with three independent BMMΦ cultures. *p ≤ 0.05, **p ≤ 0.01, ***p ≤ 0.005. The association of the bridging adaptor TRAM with TLR4 and the subsequent recruitment of TRIF are crucial early events in LPS-induced TRIF signaling. To investigate the reason for the impaired TRIF signaling in BMMCs, we performed RT-PCR and Western blotting to detect TRIF and TRAM expression. As shown in Fig. 5A and 5B, right panel, BMMCs express TRIF mRNA and protein like macrophages; however, compared with macrophages, they show a strong reduction in the amount of message for TRAM (Fig. 5A, left panel). We therefore analyzed the expression of TRAM and p-TRAM in lysates of LPS-stimulated BMMCs and BMMΦ (positive control) by Western blotting. As shown in Fig. 5B, left double bands for both proteins of ∼36–37 kDa were detectable in lysates of LPS-stimulated macrophages. These bands were strongly diminished in lysates of BMMCs. Impaired expression and activation of TRAM in BMMCs. A, RT-PCR for TRAM and TRIF. WT BMMCs and BMMΦ were activated for 60 min with 10 and 1 μg R-LPS/ml, respectively, or remained untreated (control). Total RNA (3 × 106 cells per sample) was extracted, and the presence of TRIF, TRAM, and actin (loading control) mRNA was analyzed by RT-PCR. Comparable results were obtained with three independent BMMCs and BMMΦ cultures. B, Detection of TRAM, p-TRAM, and TRIF by Western blotting. WT BMMCs and BMMΦ (107 cells/ml) were stimulated for 60 min with 10 and 1 μg/ml R-LPS, respectively. The cell lysates were analyzed by Western blotting, using Abs to TRAM, p-TRAM, and actin (loading control). Lysates of unstimulated cells were also analyzed using Abs to TRIF. Comparable results were obtained with four independent BMMC and BMMΦ cultures. C, IL-6 response of TRAM-overexpressing BMMCs stimulated with LPS. WT BMMCs were transfected with an expression vector for TRAM-HA/IRES-Tomato or for GFP/IRES-Tomato as described in Materials and Methods. FACS-sorted TRAM (Tomato+)-expressing and GFP-expressing or mock-transfected cells (105 cells per 0.1 ml) were stimulated with 1 or 10 μg R-LPS per 106 cells/ml, or they remained untreated. IL-6 and IFN-αβ were determined in culture supernatants as described in Materials and Methods. Each point is the mean of duplicates ± SD. One representative experiment of three is shown. **p ≤ 0.01, ***p ≤ 0.005. 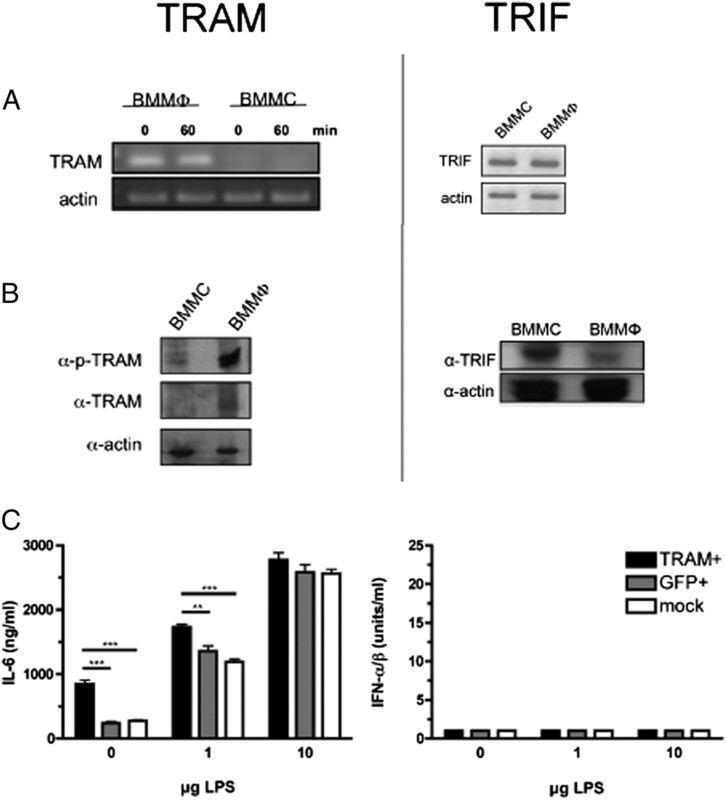 These data suggest that a strong reduction of TRAM expression and phosphorylation in BMMC could decisively contribute to the impaired TLR4-mediated TRIF signaling. We therefore transfected BMMCs with an expression-vector producing a bicistronic transcript encoding a TRAM-HA fusion protein and tdTomato fluorescent protein. A control vector encoding GFP instead of TRAM-HA was introduced into a separate sample of BMMCs. The expression of TRAM or GFP in the transfected cells was confirmed by Western blotting or FACS, respectively (Supplemental Fig. 3). As shown in Fig. 5C, TRAM+ BMMCs exhibited an enhanced constitutive IL-6 production (Fig. 5C), unlike GFP+ cells. Furthermore, TRAM+ cells produced significantly more IL-6 than GFP+ or mock-transfected control cells, when stimulated with a lower (1 μg) but not higher amount of LPS. The overexpression of TRAM enabled neither constitutive nor LPS-induced IFN-β production in BMMCs (Fig. 5C). Recent studies revealed that TRIF signaling leading to IFN-β production requires internalization and delivery of the TLR4 complex to endosomes (20). 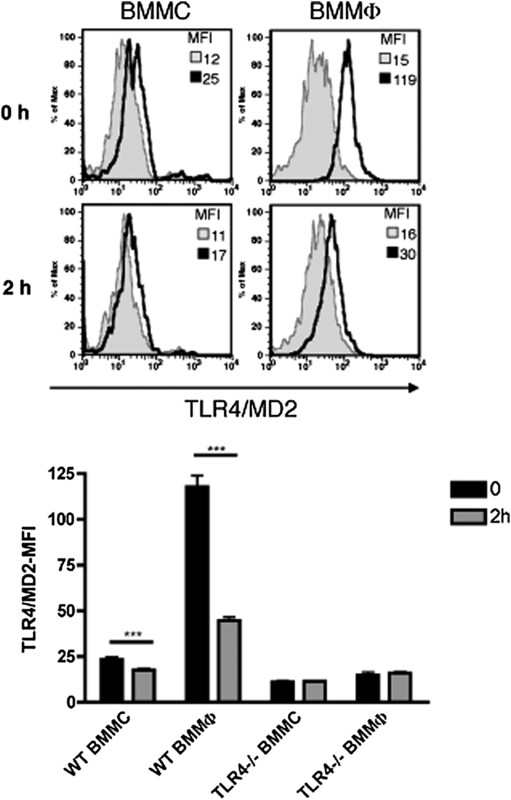 To determine whether TLR4 is internalized in mast cells, we compared the LPS-triggered disappearance of TLR4/MD-2 from the plasma membrane of BMMCs and BMMΦ by FACS. In accordance with our previous results, unstimulated BMMCs (5) exhibited substantially lower TLR4/MD-2 expression than BMMΦ (47) (Fig. 6). In BMMΦ, a strong reduction of surface TLR4/MD-2 was observed already 5 min after LPS addition and remained at this low level up to the end of the experiment (6 h; Supplemental Fig. 4). On BMMCs, a similar reduction of surface TLR4/MD-2 was not observed (Fig 6). This finding might reflect a less efficient internalization (i.e., less efficient delivery into endosomes) of the LPS/TLR4/MD-2 complex in mast cells than in macrophages. In addition, it was recently reported that LPS internalization is lacking in mast cells (48). Comparison of the disappearance of TLR4/MD-2 from the surface of LPS-stimulated BMMCs and BMMΦ. WT or TLR4-deficient BMMCs and BMMΦ (106 cells/ml) were stimulated for 2 h with 10 and 1 μg/ml R-LPS, respectively, or were left untreated (0 h). TLR4/MD-2 surface expression was determined by FACS analysis. Top panel, One representative experiment. Gray curve, TLR4-deficient cells (control); black curve, WT cells (specific expression). Bottom panel, Summary of results. Each point is the mean of quadruplicates ± SD. Comparable results were obtained in three independent experiments. ***p ≤ 0.005. MFI, mean fluorescence intensity. The synthetic dsRNA poly-IC is a potent inducer of IFN-αβ and other cytokines in macrophages (Supplemental Fig. 1). It activates cells from the endosome, through TLR3-initiated TRIF signaling, and from the cytosol through the helicase MDA-5 (22, 24). Because the induction of cytokines by poly-IC is known to be facilitated by CD14 (49), we stimulated the BMMCs with poly-IC in the presence and absence of sCD14 and determined the TNF-α, IL-6, and IFN-αβ response. As shown in Fig. 7A and Supplemental Fig. 1, TNF-α, IL-6, and IFN-αβ were not detectable in the supernatants of stimulated BMMCs, although both cytokines were induced in BMMΦ. Therefore, our data suggest that both dsRNA activation pathways are impaired in BMMCs. BMMCs fail to produce type I IFN in response to different stimuli. A, Production of cytokines in BMMCs and BMMΦ by poly-IC. WT BMMΦ (5 × 105 cells/ml) and BMMCs (106 cells/ml) were stimulated with 10 and 100 μg/ml poly-IC, respectively. In addition, BMMCs were stimulated with 100 μg/ml poly-IC in the presence of sCD14 (2 μg/ml). Poly-IC was not toxic for BMMCs when checked by propidium iodine staining and FACS analysis at the end of the experiment (24 h). TNF-α, IL-6, and IFN-αβ were determined in culture supernatants as described in Materials and Methods. Each point is the mean of duplicates ± SD. Comparable results were obtained with three independent BMMC and BMMΦ cultures. Control, mock-stimulated cells. B, Adenovirus infection rate of BMMCs. WT BMMCs (106 cells per 0.2 ml) were infected with 7.5 × 108 viral particles of AD5-GFP for 5 d. The infection rate was determined by FACS analysis plotting FL1 (infected GFP+ cells) and FL4 channels. Comparable results were obtained with three independent BMMC cultures. C, IL-6 and IFN-β mRNA expression in adenovirus-infected BMMCs. BMMCs were infected with AD5-GFP as described in B. GFP-positive BMMCs (AD5+) were isolated by FACS-sorting, total RNA was extracted, and IL-6 and IFN-β expression was analyzed by conventional RT-PCR. As a negative control, we used sorted GFP-negative cells (AD5–) and master mix alone. As positive control we used RNA from unsorted AD5-GFP-infected BMMΦ (c). Comparable results were obtained with two independent BMMC cultures. D, IFN-β mRNA expression in B-DNA-transfected cells. WT BMMΦ and BMMCs (9 × 106 cells) were transfected with 5 μg pmaxGFP (a plasmid encoding GFP from copepod Pontellina pulmata [Amaxa]) using the mouse macrophage nucleofector kit from Amaxa. Total RNA from FACS-sorted, GFP-positive cells was extracted 24 h after transfection. IL-6 and IFN-β expression was analyzed by quantitative RT-PCR. Values were normalized to actin expression. Comparable results were obtained with two independent BMMC and BMMΦ cultures. Control, mock transfected cells; w, without DNA. To further examine the ability of mast cells to produce IFN-αβ, we used two additional TLR- and TRIF-independent inducers for stimulation (adenovirus and B-DNA). The adenoviral vector GFP-expressing Ad5 is a powerful IFN-αβ inducer in mouse dendritic cells and macrophages by a yet unidentified post-endosomal pathway (26). In this study, BMMCs were stimulated with GFP-Ad5, and the efficiency of infection (i.e., the expression of GFP protein) was followed by fluorescence microscopy and FACS daily. This examination revealed that the number of successfully infected GFP-positive cells increased slowly and reached ∼30% after 5 d of culture (Fig. 7B). Nevertheless, we found no detectable secretion of IFN-αβ up to day 5 of stimulation. On day 5, the BMMCs were separated into the GFP-positive and GFP-negative fraction and analyzed for expression of IFN-β and IL-6 mRNAs by RT-PCR. As shown in Fig. 7C, whereas IL-6 mRNA was successfully induced in infected cells, the IFN-β mRNA remained undetectable. In a control experiment, and in agreement with our previous data (26), it is shown that both mRNAs can be successfully induced in GFP-Ad5–stimulated BMMΦ (Fig. 7C). B-DNA induces IFN-αβ via an unknown cytosolic sensor in numerous nucleated mammalian cells (25). To examine the IFN-αβ–inducing potency of B-DNA, we transfected BMMCs and BMMΦ with a GFP-expressing plasmid and subsequently cultured the cells for 24 h. Successfully transfected (GFP-positive) and nontransfected (GFP-negative) cells were separated and used for quantitative RT-PCR analysis of IFN-β mRNA expression. As shown in Fig. 7D, whereas GFP-negative BMMΦ already expressed detectable levels of IFN-β mRNA, these levels were still higher in the GFP-positive cells. In contrast, neither GFP-negative nor GFP-positive BMMCs expressed IFN-β mRNA. Two signaling pathways, dependent on MyD88 and TRIF, are known to emanate from the signaling LPS receptor TLR4. We demonstrate in this study that activation of murine BMMCs by LPS proceeds solely through MyD88. The TRIF pathway is not used. The absence of TRIF-dependent signaling in LPS-stimulated mast cells affects both the signaling branch leading to NF-κB activation and a strong proinflammatory cytokine production and the branch leading to the activation of IRF3 and a subsequent production of IFN-β. Furthermore, our study provides evidence that TRIF signaling is absent in peritoneal mast cells from LPS-injected mice. Thus, unlike in macrophages, the TNF-α and IL-6 response of LPS-stimulated mast cells is exclusively MyD88 dependent and the IFN-β response is absent. Finally, this study reveals that the inability of BMMCs to mount an IFN-αβ response is not restricted to TLR/TRIF-dependent activators, but also encompasses other efficient inducers, such as MDA-5–dependent dsRNA, adenoviral vector, or B-DNA. Unlike TIRAP/MyD88-dependent signaling, the TRIF signaling is thought to start after the formation of a complex between TLR4 and the bridging adaptor TRAM and internalization into the endosome-lysosome (20). While this paper was under review, a study was published (48) in which the authors demonstrated that the Gram-positive bacterium Listeria monocytogenes and the Gram-negative Salmonella typhimurium or purified LPS from Escherichia coli are not trafficked into intracellular compartments of mast cells. For this reason the above stimuli elicit proinflammatory cytokines, but no IFN-αβ in mast cells. The impaired disappearance of TLR4 from the surface of LPS-stimulated BMMCs and the lack of an IFN-β response to LPS in our study is in accordance with these findings. From the present work, it is evident that the defect in TRIF signaling (i.e., the absence of TRIF-dependent NFκ-B activation) reduces the proinflammatory cytokine response to LPS in mast cells. We also demonstrate in mast cells the absence of an IFN-αβ response to TLR-independent cytosolic activators, which cannot be explained by an impaired internalization of the stimuli. The internalization of LPS requires CD14 (21, 50, 51). Based on previous data (6, 21, 51), the lack of CD14 appeared to be one possible explanation for the absence of TRIF signaling in LPS-stimulated BMMCs. Because CD14 is a pattern recognition receptor for several microbial TLR ligands, its deficiency in mast cells probably influences the internalization and TRIF signaling of such TLR activators in general. However, our results revealed that, in contrast to the TRIF deficiency, a loss of CD14 in macrophages is not detrimental to proinflammatory cytokine production and has only a moderate, albeit significant, negative influence on the production of IFN-β induced by R-form LPS. A possible explanation for this finding might be that TRIF-signaling leading to NF-κB–dependent proinflammatory cytokine induction already starts at the plasma membrane and therefore does not need internalization. This interpretation would be in agreement with the idea of two sequential steps of TRIF signaling as proposed by Tanimura et al. (21). The first step begins at the plasma membrane and results in NF-κB activation, and the second step starts after the LPS-receptor relocation into the endosome and leads to the activation of IRF-3. This study also suggests that either signaling that leads to IRF3-dependent IFN-β production can also start at the plasma membrane or, more likely, the translocation of LPS-TLR4 into the endosome-lysosome can also occur in the absence of CD14, albeit less efficiently. Another possible explanation for the lack of TRIF signaling found in this study was an impaired expression or function of TRAM in BMMCs. It is known that TRAM deficiency prevents the association of TRIF with the LPS receptor complex and thus eliminates the TRIF signaling through TLR4 (19). We show that BMMCs exhibit strongly reduced levels of the TRAM mRNA and protein compared with BMMΦ. Furthermore, p-TRAM, which was clearly present in LPS-activated BMMΦ, was at the detection limit in activated BMMCs. Phosphorylation of TRAM and thereby its activation in response to LPS is dependent on protein kinase C (PKC)ε (52). The importance of TRAM activation for LPS responsiveness explains retrospectively why macrophages from PKCε-deficient mice exhibit heavily impaired cytokine responses to LPS (53). However, Lessmann et al. (35) demonstrated that PKCε deficiency does not impair the LPS-induced IL-6 response of BMMCs. This finding is in agreement with our present finding that TRAM–TRIF-dependent signaling does not occur in LPS-stimulated BMMCs. In an earlier study, diminished expression of TRAM was observed in mouse vascular endothelial cells and was correlated with the inability of these cells to mount TRIF-dependent immune responses to LPS (54). Thus, the lowering of TRAM levels might be a more general principle in the regulation of LPS responsiveness in different cell types. Although our experiments with TRAM-transfected BMMCs showed a partial restoration of TRIF signaling leading to proinflammatory cytokines, overexpression of TRAM was not able to restore the signaling branch leading to IFN-β induction. Thus, the diminished expression of TRAM is not the only reason for the absence of TRIF signaling in BMMCs. This conclusion is also supported by additional findings in this study. The activation of cells through TLR3 with dsRNA is known to be TRIF, but not TRAM dependent. Nevertheless, the IL-6 and IFN-αβ responses to dsRNA poly-IC were also absent in BMMCs. This finding is in agreement with Matsushima et al. (55), who demonstrated that murine BMMCs stimulated with TLR3, TLR7, and TLR9 activators (including dsRNA) exhibit impaired proinflammatory cytokine and chemokine responses. The lack of dsRNA signaling is not due to TLR3 deficiency, because the expression of TLR3 in mast cells has been demonstrated (55, 56). In view of the more recent discovery of an alternative, TRIF-independent induction of cytokines by synthetic dsRNA—poly-IC through the cytosolic sensors MDA-5 (22, 57)—we conclude that TRIF signaling and this alternative induction pathway are impaired in BMMCs. It should also be mentioned that there is no consensus regarding the absence of cytokine response to dsRNA in mouse BMMCs. Thus, it was reported that stimulation of BMMCs with dsRNA, but not with LPS, leads to IFN-α production (56). Others (58) described an upregulation of IFN-β expression in dsRNA-stimulated BMMCs; however, the expression at the protein level was not studied. Interestingly, the latter authors observed, as did we, an absence of IL-6 response to dsRNA in mast cells. The reason for the discrepancies between the various studies is not clear at present. A more recent study by Kato et al. (24) revealed that shortening of the poly-IC length converted this MDA-5 ligand to a RIG-I ligand. Accordingly, differences in the length of the different dsRNA used in the different studies may be responsible for the conflicting results. BMMCs were also unable to produce IFN-αβ in response to other known inducers, the adenoviral vector GFP-Ad5 or B-DNA. The former agent is a potent IFN-αβ inducer in dendritic cells and macrophages, and the latter induces IFN in different nucleated cell types. Both agents use distinct, TRIF-independent cytosolic activation pathways (25, 26). Treatment of BMMCs with the adenoviral vector resulted in the expected expression of GFP and the induction of IL-6 (Fig. 7), which excluded the possibility that an impaired virus entry might be responsible for the absence of an IFN-αβ response in these cells. Furthermore, efficient expression of several encoded proteins in BMMCs excluded the possibility that an impaired B-DNA transfection was the reason for impaired IFN-αβ induction. Given that BMMCs produce IFN-αβ in response to Newcastle disease virus (58) and vesicular stomatitis virus (48), both of which are ligands of RIG-I (24), it appears that the inducibility of IFN-αβ in murine BMMCs is restricted to selected viral stimuli. Whether the IFN-αβ–inducing activity in mast cells is restricted to RIG-I–activating viruses (and artificial dsRNA) is an interesting question for future studies. The new data showing that TRAM overexpression supports the proinflammatory cytokine production, but is not sufficient to induce IFN-β production, suggests that other molecules in the LPS-induced signaling pathway are also impaired in mast cells. In particular, the data presented in this study regarding the lack of IFN-αβ production by other well-known inducers of IFN-αβ (dsRNA, adenovirus, B-DNA) that normally do not signal through TLR4-TRAM-TRIF suggest that impaired signaling events downstream of TLR4-TRAM-TRIF, possibly shared by other non-TLR inducers of IFN-αβ, contribute to the lack of IFN induction in mast cells. Over the past decades, several signaling molecules shared by TLR and cytosolic IFN-αβ inducers have been found (see review in Refs. 59, 60). To identify suitable candidates, the evaluation of microarray data obtained from bone marrow-derived macrophages and mast cells will be helpful. Particular components of the signaling platforms used by TLR, as well as cytosolic receptors such as TRAF3, TBK1, and IKKε (59, 60), are of interest. Both the lack of specific components and differences in the amounts of the proteins involved can be expected. The inability of LPS to activate the TRIF-dependent pathway in cells was also observed in other mammalian species. Human neutrophils stimulated with a combination of LPS and IFN-γ expressed higher levels of TNF-α, but not IFN-β mRNA, and failed to activate IRF3 (61). Furthermore, LPS failed to induce IFN-β mRNA in a chicken macrophage cell line or in chicken blood leukocytes, although they upregulated the expression of mRNA for IL-1β and IL-8 (62). These findings indicate that the involvement of TRIF signaling in LPS activities is specific to cell type and species. They predict that some inhibitors of TLR4 signaling might have distinct roles in different cell types or animals. We assume that the absence of TRIF signaling, which limits the biologic activity of LPS, might be one of the mechanisms for the prevention of excessive, life-threatening host responses, especially at the interfaces between the host and environment or in the endothelial system during sepsis. Mast cells are found at all these locations and thus frequently encounter commensal Gram-negative bacteria and pathogens. The absence of TRIF signaling in mast cells could have several advantages, both under physiologic and pathologic conditions. The recognition of commensals by TLRs and subsequent MyD88-dependent production of cytoprotective cytokines, including IL-6 and TNF-α, was shown to be required for intestinal epithelial homeostasis and critical for the protection against gut injury (63). Mast cell-derived TNF-α is required for the protection of mice against acute bacterial peritonitis (64). It is likely that the lack of TRIF signaling in mast cells guarantees a moderate protective cytokine production without harmful inflammatory effects of TNF-α and IFN-β at these sites. We thank A. Meier, P. Lüderitz, H. Garbers, M. Mitterer, and K. Fehrenbach for technical assistance and S. Saccani for useful discussions and for reading the manuscript. 2007. Structural biology of the LPS recognition. Int. J. Med. Microbiol. 297: 353–363.
. 1999. Endotoxin interactions with lipopolysaccharide-responsive cells. Clin. Infect. Dis. 28: 476–481.
. 2006. R-form LPS, the master key to the activation ofTLR4/MD-2-positive cells. Eur. J. Immunol. 36: 701–711.
. 2005. CD14 is required for MyD88-independent LPS signaling. Nat. Immunol. 6: 565–570.
. 2002. Essential role for TIRAP in activation of the signalling cascade shared by TLR2 and TLR4. Nature 420: 324–329.
. 2003. TLRs: differential adapter utilization by toll-like receptors mediates TLR-specific patterns of gene expression. Mol. Interv. 3: 466–477.
. 2003. TRAM is specifically involved in the Toll-like receptor 4-mediated MyD88-independent signaling pathway. Nat. Immunol. 4: 1144–1150.
. 2003. Identification of Lps2 as a key transducer of MyD88-independent TIR signalling. Nature 424: 743–748.
. 2003. Toll/IL-1 receptor domain-containing adaptor inducing IFN-beta (TRIF) associates with TNF receptor-associated factor 6 and TANK-binding kinase 1, and activates two distinct transcription factors, NF-kappa B and IFN-regulatory factor-3, in the Toll-like receptor signaling. J. Immunol. 171: 4304–4310.
. 2001. Lipopolysaccharide stimulates the MyD88-independent pathway and results in activation of IFN-regulatory factor 3 and the expression of a subset of lipopolysaccharide-inducible genes. J. Immunol. 167: 5887–5894.
. 2008. TRAM couples endocytosis of Toll-like receptor 4 to the induction of interferon-beta. Nat. Immunol. 9: 361–368.
. 2008. Roles for LPS-dependent interaction and relocation of TLR4 and TRAM in TRIF-signaling. Biochem. Biophys. Res. Commun. 368: 94–99.
. 2009. Structural basis of double-stranded RNA recognition by the RIG-I like receptor MDA5. Arch. Biochem. Biophys. 488: 23–33.
. 2006. A Toll-like receptor-independent antiviral response induced by double-stranded B-form DNA. Nat. Immunol. 7: 40–48.
. 2008. Key role of splenic myeloid DCs in the IFN-alphabeta response to adenoviruses in vivo. PLoS Pathog. 4: e1000208.
. 1968. Clottable protein in Limulus; its localization and kinetics of its coagulation by endotoxin. Thromb. Diath. Haemorrh. 19: 186–197.
. 2000. Divergent response to LPS and bacteria in CD14-deficient murine macrophages. J. Immunol. 165: 4272–4280. LIGO Scientific Collaboration. 2008. Search for gravitational-wave bursts from soft gamma repeaters. Phys. Rev. Lett. 101: 211102.
. 1986. Requirement for lipopolysaccharide-responsive macrophages in galactosamine-induced sensitization to endotoxin. Infect. Immun. 51: 891–895.
. 2007. Granzyme B is expressed in mouse mast cells in vivo and in vitro and causes delayed cell death independent of perforin. Cell Death Differ. 14: 1768–1779.
. 2006. A redundant role for PKC-epsilon in mast cell signaling and effector function. Int. Immunol. 18: 767–773.
. 2009. Requirement for CD45 in fine-tuning mast cell responses mediated by different ligand-receptor systems. Cell. Signal. 21: 1277–1286.
. 1985. Characterization of receptors for human tumour necrosis factor and their regulation by gamma-interferon. Nature 318: 665–667.
. 2006. Initial Fc epsilon RI-mediated signal strength plays a key role in regulating basophil signaling and deactivation. J. Allergy Clin. Immunol. 118: 1060–1067.
. 2005. Polymorphisms of CD14 gene and TLR4 gene are not associated with ulcerative colitis in Chinese patients. Postgrad. Med. J. 81: 526–529. 2008. Sample prep for proteomics of breast cancer: proteomics and gene ontology reveal dramatic differences in protein solubilization preferences of radioimmunoprecipitation assay and urea lysis buffers. Proteome Sci. 6: 30.
. 2009. Two modes of transcriptional activation at native promoters by NF-kappaB p65. PLoS Biol. 7: e73.
. 2000. Bacterial induction of beta interferon in mice is a function of the lipopolysaccharide component. Infect. Immun. 68: 1600–1607.
. 2003. Intracellular phospho-protein staining techniques for flow cytometry: monitoring single cell signaling events. Cytometry A 55: 61–70.
. 2008. LPS/TLR4 signal transduction pathway. Cytokine 42: 145–151.
. 2005. Achieving stability of lipopolysaccharide-induced NF-kappaB activation. Science 309: 1854–1857.
. 2003. Toll-like receptor 4 expression levels determine the degree of LPS-susceptibility in mice. Eur. J. Immunol. 33: 798–805.
. 2006. Double-stranded RNA-mediated TLR3 activation is enhanced by CD14. Immunity 24: 153–163.
. 2006. Endocytic pathways regulate Toll-like receptor 4 signaling and link innate and adaptive immunity. EMBO J. 25: 683–692.
. 2006. Trif-related adapter molecule is phosphorylated by PKCepsilon during Toll-like receptor 4 signaling. Proc. Natl. Acad. Sci. USA 103: 9196–9201.
. 2001. Protein kinase Cepsilon is required for macrophage activation and defense against bacterial infection. J. Exp. Med. 194: 1231–1242.
. 2006. Absence of TRAM restricts Toll-like receptor 4 signaling in vascular endothelial cells to the MyD88 pathway. Circ. Res. 98: 1134–1140.
. 2004. TLR3-, TLR7-, and TLR9-mediated production of proinflammatory cytokines and chemokines from murine connective tissue type skin-derived mast cells but not from bone marrow-derived mast cells. J. Immunol. 173: 531–541.
. 2008. Lipopolysaccharide sensing an important factor in the innate immune response to Gram-negative bacterial infections: benefits and hazards of LPS hypersensitivity. Immunobiology 213: 193–203.
. 2010. Deciphering the complexity of Toll-like receptor signaling. Cell. Mol. Life Sci. 67: 4109–4134. 2011. Antiviral signaling through retinoic acid-inducible gene-I-like receptors. Arch. Immunol. Ther. Exp. (Warsz) 59: 41–48.
. 2007. The MyD88-independent pathway is not mobilized in human neutrophils stimulated via TLR4. J. Immunol. 178: 7344–7356.
. 2008. Unique properties of the chicken TLR4/MD-2 complex: selective lipopolysaccharide activation of the MyD88-dependent pathway. J. Immunol. 181: 4354–4362.
. 2009. TPL-2 negatively regulates interferon-beta production in macrophages and myeloid dendritic cells. J. Exp. Med. 206: 1863–1871.
. 2008. IFN-beta production by TLR4-stimulated innate immune cells is negatively regulated by GSK3-beta. J. Immunol. 181: 6797–6802.